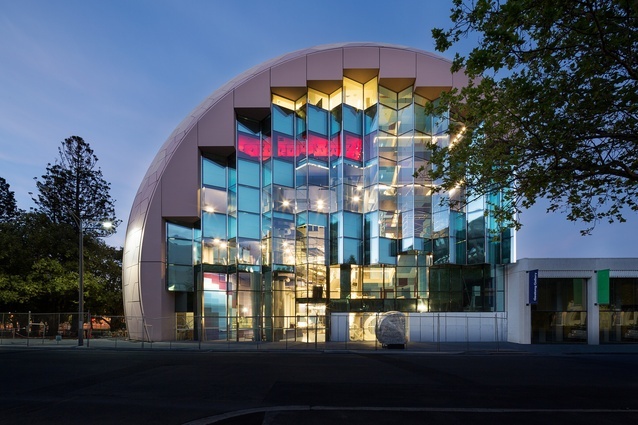 Bold and ambitious, the Geelong Library and Heritage Centre’s imposing geodesic domed structure, with its parkland-facing wall of glass, projects boldly outwards into Geelong’s cultural precinct like a giant cerebral cortex. It’s no wonder that Mayor Darryn Lyons quipped, when it opened in November 2015, that it was Geelong’s ‘Big Brain’. The dome, with its direct lineage to the State Library of Victoria and other grand temples of knowledge, is clad in a palette of muted brown hexagonal tiles further emphasising the cellular neural circuitry of the cranium it protects. Plenty has already been said about the architectural ambition and finely rendered execution of the building and its interiors. Architecture firm Ashton Raggatt McDougall (ARM) has done a fine job. More than the building, though, the Geelong Library and Heritage Centre embodies the hybrid vigour of space, technology, switched on staff, carefully curated collections, and, most of all, the priceless invitation to support, nurture, stimulate and embed a truly creative community. And, of course, that’s a segue for me to mention Creative Communities (2014). Patti Manolis, the Geelong Regional Library Corporation’s CEO, was a driving force behind this landmark cultural benefits study, and an active member of the reference group that framed and guided the 12-month research process. Sally Gray and I conducted the research, sifting through a mountain of theoretical and action research outcomes to arrive at six lenses through which cultural benefits can be seen, described and, in some cases, quantified. Sally and I were fortunate to be able to travel to Geelong together, and to have Patti as our tour guide. Arriving at Geelong’s charming 19th century railway station, the first thing we saw was the gleaming 21st century library. The way the building embraces Johnstone Park, the cultural precinct within which it sits, and the wider civic precinct, is brilliant. It looks like it belongs there; a feat of good place-based design. Architect Ian McDougall talks about its skin and bones, its award-winning dome cladding system, its outcrops and grotto-like visage, its ledges and eyries. I’m really interested in the interior, though, because that’s where people gather, think, do things alone or together, learn and play. And McDougall has something really interesting to say about that, too. A multi-level commercial space. A tuned instrument. A modern machine. Is Le Corbusier’s ghost haunting the building? Maybe, but machine metaphors and libraries are not a natural pair. As Patti took us from one level to another, the thing that struck Sally and I the most was the inventive use of colour and textures, the incredible attention to detail, and a human-centred ethos that rescues what could be a ‘multi-level commercial space’ and instead creates a joyful place for learning, love and connection. Love? Where better than a library to rendezvous, hang out, and, well, who knows? The first three public levels – ground floor gathering space with its mezzanine vantage platform and maker space, the ‘resting nest and cave’ for kids and young adults, the ‘inspiration space’ with its quiet ambiance, polished concrete floor and impressive collection – are all swathed in various shades of blue. Ceiling, wall panels, floors, and lots of the furniture and fittings – all blue from deep marine to aqua, and various hues in-between. Blond desks and tables, leopard-skin fabric chairs, and warm spherical lighting break up what might otherwise be too intense. Even the toilets are decked out in blue Italian mosaic tiles, which are thrilling to look at and touch. Everything is of the highest quality: joinery, fittings, furnishings and shelving. I loved the Eames-designed wooden elephants and the crazy jigsaw elements of the hungry caterpillar in the ‘resting nest’; the specially designed family restroom for breast-feeding mothers with its toilets for adults and kids; the gorgeous Patricia Urquiola woollen ottomans; the swirling patterns in the polished concrete floor of the ‘inspiration space’, something Patti was initially worried about, but, when accompanied by high-tech sound absorption ceiling tiles, has produced a spongy, soft and harmonious outcome. In contrast to the blue palette of the first three levels, the Heritage Centre, or Vault, is a lavish crimson red. It is such an intense and thought-inducing space; I could imagine working here happily for hours at a time. Discarded objects from the old library site have been reinterpreted by local artists and placed in strategic positions on bespoke red shelving. The Heritage Centre’s Cruiser smart-touch table enables a playful engagement with digitised images, newspapers and historical documents. Behind-the-scenes there is an impressive archive repository with over four kilometres of mobile shelving. Every floor has an Indigenous name as well, and I loved the name local Wathaurong people ascribed to The Vault, Kim barne thaliyu, or ’here yesterday’. As we were meeting Patti, we were able to explore the administration floor as well. It is an exercise in Nordic beauty; with its muted palette, Herman Miller office chairs, sun-filled lunchroom and balcony, clever shelving and work stations – I bet people love coming to work every day, I would. The top level or High Ground, with its sweeping vista of Corio Bay, is named Wurdi Yuang – Big hill in the middle of the plains – a reference to the You Yangs, which were only a shimmering and indistinct outline on the hot, smoggy day of our visit. The high ground is essentially a large function space, and it makes the most of the building’s hexagonal tiled roof and ceiling. The space can be divided in two; with one half opening outwards to a north-facing deck; and the southern half becoming a somewhat dark seminar space. The latest in audio visual technologies have been ingeniously hidden behind panels, pipes and flooring. Importantly, the High Ground is also a source of revenue, and the GDHC has appointed someone to manage the commercial side of things. Of course, a public library is more than its architecture, as gloriously important as that may be. Public libraries are arguably the most democratic of spaces; more diverse and welcoming than museums and galleries, parliamentary buildings and opera houses. They don’t ask for adulation and awe, money or prior knowledge. And, as Sally and I argued in Creative Communities, they generate the strongest of bonds with their users and communities. A bond that people describe in the most poetic and lyrical of ways. When I last visited Geelong in 2013, I was struck by the hope and pride residents had already invested in a central library that had yet to be built. Describing it as ‘the jewel in the cultural crown’, a ‘thing of delicate beauty’, the people I met in workshops and on the street exuded a palpable sense of anticipation. And I felt it was more than the building itself that had captured the collective imagination; it was also something about the fact that their civic administration has been prepared to invest so much in a new library. It was the cultural ambition behind the act; the symbolism of a genuine people’s palace; a gesture of democratic inclusion, participation and the valuing of knowledge. Are they happy with the end result? As she says this we notice a couple of young adults curled up, sound asleep, on beanbags in the ‘nest’. Sally and I had a great day out at the Geelong Library and Heritage Centre. There is so much more to be said about a library that successfully braids together a thoughtful, painstaking attention to detail with human service intelligence and community aspiration. We would also like to acknowledge the honour Patti received the day before our visit. She has now been inducted into the Victorian Honour Roll of Women for her innovative library leadership. You can read more about it here.